History of gambling, which has become of the most popular kinds of entertainment nowadays, dates back to the ancient times. Archaeologistsprove that the very first dice-like objects we created more, than 30,000 years ago. Yet, official records of playing were made much later, around 2300 B.C. in China. Moreover, there were also Greece and Egypt, Japan and India, where the evidence of gambling was found. The age of the Roman Empire turned out to be an epoch, when gambling in its much greater diversity has increased its popularity among people, even the emperors, such as Claudius and Caligula, being involved in playing. Eventually, all children were expected to be taught to throw dice, as the lawmakers declared. Further on, in the Medieval Times, gambling has made huge steps in its development; in particular, the creation of new games took place. In the 13th - 14th centuries there were invented the first playing cards, although the vast majority of scholars still argue, whether France or Chinese Turkestan may be called there motherland. Nevertheless, official records prove that it were the French, who presented the original card design, comprising 4 card suits: diamonds, hearts, clubs and spades, even now used in all poker and blackjack variations; and started manufacturing them. Regardless of this, it was only 4 centuries later, when cards of the similar design gained the same popularity in England, due to which the country-based production of them began. Still, it were the Americans, not the English, who added much to the design of cards, making them rather alike with those used nowadays, and created the whole market of these. Apart from Asia, where the history of gambling took its own way of development, including different gaming concepts and versions of playing cards, Europe and the US were the ones to introduce most of the games, famous all around the world today. In the 18th century, in particular, one of the favorites among gamblers, blackjack, saw its appearance in France, being called "vingt et un", or "twenty-one". 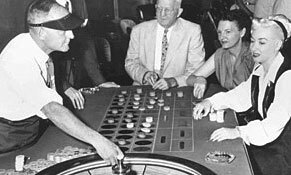 Later on, having become incredibly popular in the European countries, it further spread on to the USA, where became one of the most essential games in casinos, especially after a profound step in land casinos evolution, when gambling had been made legal in Las Vegas in 1931. During the 20th century, blackjack only increased its popularity, so that even the famous mathematicians dedicated their whole books to the ways of improving one's skills in beating the dealer. As for another card game, likewise popular as blackjack, such as modern poker, its forerunner is believed to be the game of chance, spread in Italy and England, of course, while the techniques of betting were created and further developed in France. Yet, itwere the British, not the French, who became the Fathers of bluffing, having both invented and developed its concept. Later, the game began spreading all around Europe, and the USA, where faced numerous modifications, till it has reached its present-day look. Apparently, the 20th century was the Golden Age for the history of gambling, concerning not only the card games, but also lotteries, roulette and, especially the slot machines history, the creation of which brought more and more people to casinos. As for the latter, it was also created and developed by the Americans, who started the mass production of these in 1910, the look of revolving surfaces being soon modified to more familiar fruit.Having faced a great number of alternations, most variations of slot machines are now as much presented online as in more traditional land ones. Today, at the beginning of the new millennium, almost everyone of us has a certain gambling experience, from throwing a dice at home, when being 5 or 6, to playing baccarat somewhere in the land casino), or just in front of one's PC, becoming a devoted blackjack player of the online casinos. Fortunately, the gambling industry never stands still, so more modifications are constantly made to feel every client happy and content.